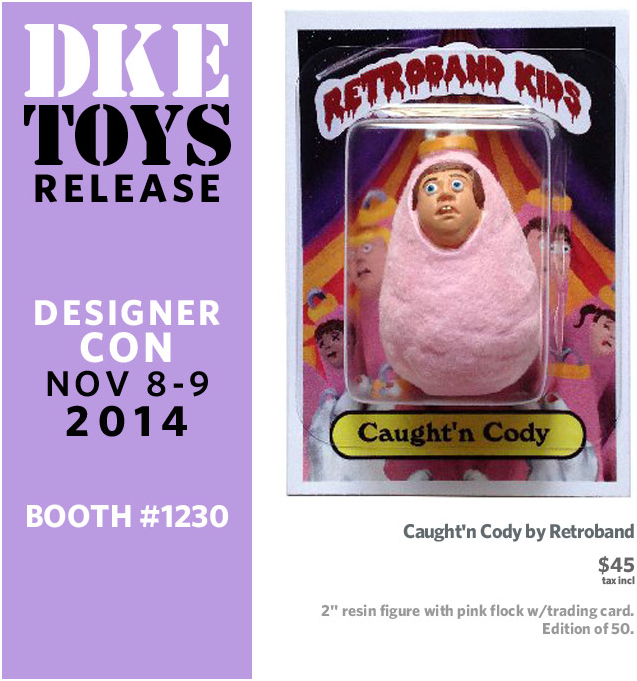 The guys over at DKE Toys are proud to reveal another exclusive custom bootleg release they’ll be bringing along to Designer Con 2014 next month, the Caught’n Cody mini figure from Retroband! The third figure in the artist’s GPK inspired line Retroband Kids, the 2″ tall piece has been hand sculpt and cast in resin, coming in a pink flocking and mounted on a blistered trading card. Limited to an edition of 50 figures priced at $45 each, Caught’n Cody will be up for grabs at the DKE DCon booth (#1230) from November 8th to November 9th. Look out for more DKE exclusives on the site soon!